This fabulously designed, beautifully printed, full color, oversize hardcover volume published by the intrepid Canadian supporters of fine comics, Drawn & Quarterly, is the 2008 Copacetic Book of the Year™. What It is, the long awaited, all new, 208 page hardcover volume of heuristic metacomix by the one and only Lynda Barry, is both a beautiful and inspiring work of art and an insightful exploration of the creative process. Her first new work since her 2002 masterpiece, 100 Demons, What It Is uses the language of comics to probe the secrets of creativity itself. This leads her deep into the caverns of philosophy, where, ever the intrepid explorer, Ms. Barry undertakes an especially thorough excavation of the cave of epistemology. There in the murky darkness she discovers that memory and imagination blur and merge amidst the stalactites and stalagmites of our respective genetic heritages before condensing and collecting in placid prehistoric pools to mix with the ancient amoebas, in the process dissolving time itself. The past, present and future come together -- an instant and an eternity stand as one in the revelation that it all starts with... The Image! "The words of the language, as they are written or spoken, do not seem to play any role in my mechanism of thought. The psychical entities which seem to serve as elements in thought are certain signs and more or less clear images which can be `voluntarily' reproduced and combined.... This combinatory play seems to be the essential feature in productive thought--before there is any connection with logical construction in words or other kinds of signs which can be communicated to others.... The above mentioned elements are, in my case, of visual and some of muscular type. Conventional words or other signs have to be sought for laboriously only in a secondary stage, when the mentioned associative play is sufficiently established and can be reproduced at will." 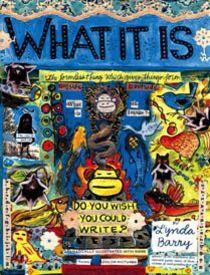 Returning to What It Is: The book itself is a step by step analysis of the processes of how "The Image" -- as conceived by Lynda Barry -- comes into being which leads ineluctably to how we can use the image to create -- works of art, a new sense of self, even a better world. The artwork that constitutes What It Is integrates text, image and narrative in a fundamentally novel manner. While collage has, obviously, been a staple of modernism for nearly a century now, and juxtapositions of found text and image are fairly commonplace, here Ms. Barry successfully grafts collage onto comics and in so doing gives us something that is charming, engaging, beautiful and new. Barry's collages integrate items heavily laden with emotional baggage such as "found" drawing and writing by children, personal letters and snapshots, and text and images cut from children's school books, along with more neutral items such as postage stamps (with an accent on President Lincoln), book and magazine clippings and all sorts of odds and ends. All of these collaged objects -- often altered by over painting and/or overdrawing -- are intertwined and held together to varying degrees with Barry's own visuals created in a variety of media -- primarily employing the ink brush -- and thereby deftly worked into fully composed pages. But all this is only the beginning. The real story takes place when these fully composed pages are placed one after the other and then read, in conjunction with the more normative comics work that is strategically sprinkled throughout. What It Is, while firmly rooted in Western artistic practices, is very much informed by and draws much of its strength from distinctly Eastern sources. Intuitively incorporating creative approaches rooted in a variety of ways of seeing -- most notably those of the I Ching and the Tao -- with her hardwired modernist comics sensibility, while simultaneously leveraging the implicit sympathy of text and image in far east languages (see below), Ms. Barry has created a substantially original synthesis of disparate traditions. Recent advances in neuroscience conclusively show that the human brain has evolved to process images and text in specific, different ways. (As regards text, this is especially true in the case of western languages that are written using phonetically based alphabets, as opposed to many eastern languages whose written forms are evolved from pictograms and so are still rooted at a fundamental level in images and are thereby likely, when processed by the brain, to share more of the same neurocircuitry with image processing than their western cousins.) Information related to visually perceived images are also sorted and categorized differently and stored in different places in the brain, apart and distinct from visually perceived textual information, and this visual and textual information is, in turn, broken down into numerous sub-categories that are spread hither and yon within the vastly complex web of the human brain*. It is during the engagement of recollection and imagination -- the alpha and omega of artistic creation -- that the brain gathers together all the disparate bits to forge a whole. And it is, more or less, this process of drawing together -- of conception -- that constitutes "The Image" which is the powerful center of What It Is. Barry has over the years of practicing her craft developed an uncanny awareness of this process and her work reflects this awareness to an unmatched degree. In this context, comics can be considered -- by virtue of the fact that its essential nature consists of employing a multiplicity of methods in the service of combining image and text in an ever increasing variety of ways (and, in fact, can be considered [see Chris Ware] as a way to employ images as text) -- a unique and powerful form, one that has the potential to establish a massive new constellation of neural connections. Lynda Barry is then, in this view, an astronomer of the mind who has turned her telescope inwards. Recollections from her childhood form the core of the bulk of Lynda Barry's work, and, in this respect, What It Is is no exception. This time around she is working harder to universalize her own experience, initially through her employment of found work by children whose childhoods, roughly speaking, correspond chronologically with her own. Once again her work is focused on demonstrating that our childhood experiences form the center of gravity about which our adult life orbits, and that the ellipses of these orbits -- the courses our adult lives take -- are fixed by these childhood experiences, once and for all, for better and for worse. All this is, however, only the point of departure, for What It Is is a book with an agenda and that agenda is to provide the reader with the creative insights necessary to exploit these childhood experiences in the service of creativity. First and foremost, by revealing the essential nature and function of these childhood experiences and the memories that have accreted around them, Barry aims to show the reader that s/he not only has permission to "play" with these experiences, but that doing so is essential to her or his own emotional, mental and, ultimately, even physical well being, for it is precisely in playing with our inner selves that we stimulate our neural networks into creating new connections, and it is with these new connections that we can create art and stories of our own which in turn create further connections, setting in motion a never ending (as previously asserted, the number of connections it is possible to make in one human brain is close enough to infinite as to be ungraspably large and clearly unobtainable) and ever growing virtuous circle of creation. 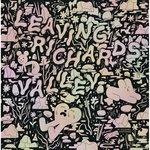 Lynda Barry, long considered among the major contemporary comics creators, has, with What It Is, taken comics to a new place and created a work that can stand shoulder to shoulder in the pantheon with those created by Frida Kahlo, Jean Michel Basquiat, and Hayao Miyazaki, to name but a few of her new peers. This book is full of surprises and delight, and while we've managed to go on at quite some length here, there's really only one thing to say about this book, and that is, "YES!!!" Still need convincing? Feast your eyes on this amazing (lucky)13-page preview. Want more? Then how about this short NYTimes-hosted web video wherein Ms. Barry discusses What It Is.